I have teamed up with the amazing Axis Game Factory to help celebrate their newly released Zombie FPS and Fantasy Side Scroller DLC products with a fantastic chance to win the AGFPRO program and their Battlemat minatures battle system DLC! I’m always happy to see more opportunities for online tabletop gaming, and this one really catches my attention as a Dungeon Master. Please note that this is not a review of the program or DLC, just a quick rundown and a free giveaway for you to enioy! AGFPRO is a comprehensive toolset program specifically designed to provide even casual users with a program that can create games with unique environments and multiple level support and options for game development. Though originally designed to run in concert with the free or professional versions of Unity 4, it does not require the Unity 4 program to play and is fully functional as a stand alone creation system. AGFPRO also has two available versions: Basic and Premium. 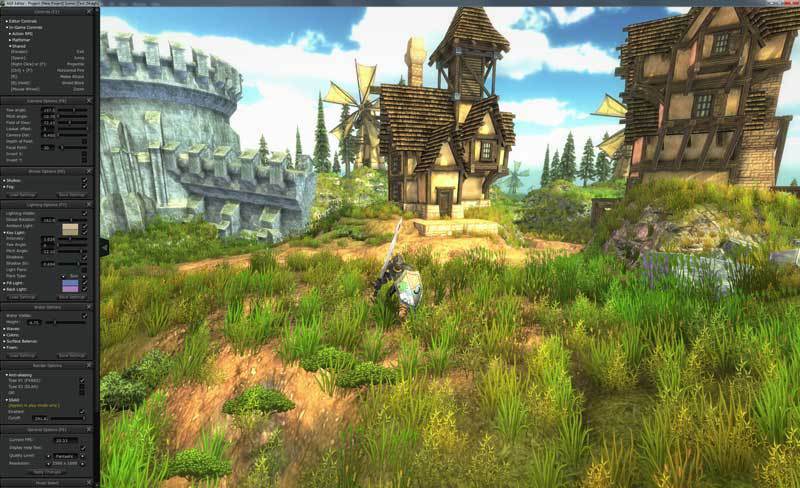 Both packages include the world editing, construction, and gameplay tools necessary to make and play a basic game model and both versions offer full support for any of the downloadable content packages; the Premium also includes Unity 4 conversion and support, use of hundreds of AGF sourced artwork, and the new ability to import/export hieghtmaps (any .png file can become a terrain!) Both packages (and the downloadable content) also run efficiently on Windows, Mac, or Linux.